Bali is one of the many islands that make up Indonesia. It is small but distinctly unique, even from the rest of Indonesia. While Indonesia is mostly a Muslim country for instance, the island of Bali is more than 90% Hindu in their religious beliefs. This effects daily life quite a bit. 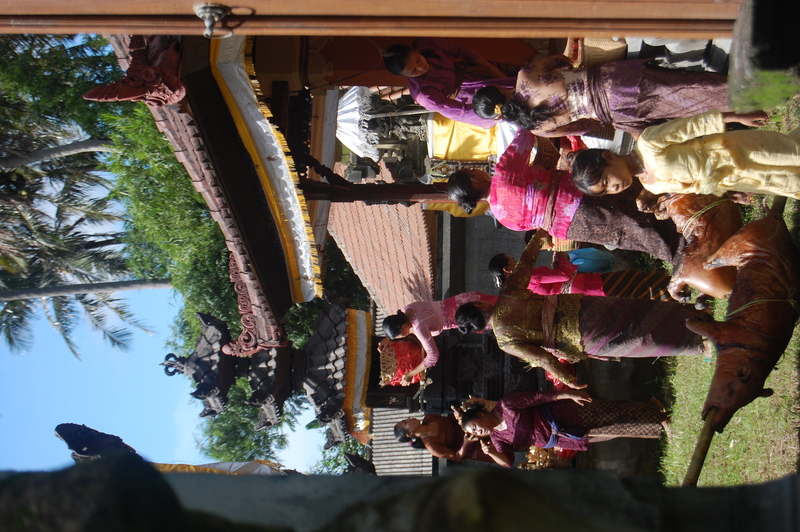 Most Balinese families participate in daily rituals by placing an offering of food and incense at a designated altar at their house or place of business. They replenish this offering three times a day, believing that this practice pleases the Hindu gods and may bring good fortune to their families or to their business. In addition to daily practices, Balinese Hindu people will reunite with their extended families every fifteen days to pray together at the family temple. This ceremony involves lots of food and flowers. A priest leads the ritualistic prayers inside the temple walls. When the rituals are finished, the families gather around their food offerings to eat what has been blessed. Often this includes a “Babi Guilin” or a young roasted pig, prepared for the gods. Balinese Hinduism includes a belief in Karma. This is the belief that doing something good ensures that something good will happen to you in return, and likewise, doing something bad will result in something bad happening in return. I met many Balinese people while traveling on the island, and each showed me lots of kindness. Their belief in karma is strong and they try very hard to live according to these beliefs. Their is also a belief that Balinese Hindus must assign specific names to their children. This is one way of identifying whether someone is Balinese or from elsewhere. One young man we spoke with firmly believed that breaking from this tradition would cause a person to become ill. This is an example of karma. He said that if he did not go by his Balinese Hindu name of “Made,” (assigned to a second-born son,) than he would become very sick until he went back to using this name. It was very surprising to me that so many people in Bali share the same name, but I am coming to realize that many countries assign a name to their children based on birth-order. This child may eventually receive a nick-name of sorts, but their official name is still maintained as a very important title. Every first-born Balinese child, whether girl or boy, is named “Wayan,” (though “Lo” was another option for first-born women only). The second-born may be either “Made” or “Kadek,” as well as “Putu” in some regions. Third born children are named “Nyoman” or “Komang” whether they are male or female and the fourth child is “Katut.” If a fifth child is born, the order begins again. Karma: a belief that one’s fate is determined by their actions: a good action will lead to good fortune and a bad action will lead to bad fortune. This also beans that practicing one’s religion poorly will result in something bad while practicing one’s religion with devotion will lead to something good. This is usually accompanied by a belief in past lives that contribute to one’s karma as well as future lives within which time a person may continue to be rewarded or punished. I found the way they name their children to be very interesting! In a classroom full of children, that could be very challenging indeed!